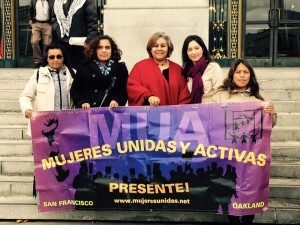 Editorial Note: Today’s guest blog post comes from Mujeres Unidas y Activas (MUA), a long time partner of The San Francisco Foundation. We’re thrilled to lift up this inspiring work as we celebrate Cesar Chavez Day. Domestic workers–a primarily immigrant women workforce of nannies, caregivers, and housecleaners–have been fighting for more than seven years to see the value and dignity of our work reflected in California state labor law. 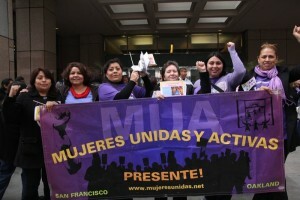 Mujeres Unidas y Activas (MUA) has been the forefront of this movement building since 2004 when we defined winning labor protections for immigrant domestic workers as our primary organizing focus. Since that time, we have come together with organizations across the state to found the California Domestic Worker Coalition and successfully passed AB241, the Domestic Worker Bill of Rights. This year, MUA is leading the California Domestic Workers Coalition in introducing SB1015 with Senator Connie Leyva (D-Chino), which would defend overtime equity and support dignified labor standards for California’s domestic workers. SB1015 continues the success of our ground-breaking 2013 legislation which granted long-overdue overtime protections to the state’s caregiving workforce. SB 1015 seeks to remove the sunset provision in AB241 because we believe our families deserve permanent protections. This past Monday, over 70 domestic workers traveled to Sacramento to begin talking with legislators about SB1015. Caregivers like Myrna Rivera Asan from Pilipino Workers’ Center in Los Angeles who took a day away from work, leaving her home at 6 pm and traveled all night on a bus to arrive at the Capitol at 6 am so that she could share the good news that AB241 has worked. After years of working 24 hours a day 5 days a week, she now has a 12 hour schedule, receives the minimum wage and overtime pay, and can spend time with her family and contributing to her community. Myrna was joined by Monique Harris and other members of Hand in Hand, the Domestic Employers Network. As someone living with a disability, Monique shared that the attendants she has employed since she was 18 years old have helped her to raise her son, graduate from college and make it possible for her to be a successful artist and business owner. She supports overtime protections for domestic workers because she knows that the work is hard, important, and dignified. On Wednesday, April 6, Mujeres Unidas y Activas will join our Bay Area Coalition partners in sending 3 buses to Sacramento to testify in support of SB1015 at the Senate Labor Committee and continue pushing our movement forward. We believe that domestic workers should be recognized, celebrated and protected for improving the quality of life for children, seniors, people with disabilities and their own loved ones. Since the passage of the original Domestic Worker Bill of Rights, domestic workers have taken to the streets to conduct expansive community education and enforcement campaigns all across the state. As a result, domestic workers have reported improved confidence and ability to advocate for dignified standards in their jobs and employers have more clarity about workplace standards. Without the passage of SB 1015, much needed state protections would no longer apply to this historically excluded workforce. It’s time to uphold the dignity of domestic workers and make overtime a permanent labor protection for all workers. We hope you will join our movement!